I finished Elijah of Buxton by Christopher Paul Curtis this morning and I liked it. I like historical fiction and this shows a different side of slavery. It seemed to be a lot of set-up for the final chapters of excitement but what it has to say about freedom is incredibly powerful. I loved the language of the book! This was selected by my multicultural book group of 5th graders at school and the language was difficult for them. I read a few paragraphs aloud to them so they could get a feel for it and that helped a lot! this will be the last book we read together as they go off to 6th grade. Hopefully, a few out of the 10 students will continue to discover new books after trying new choices through this club. We read The devils' arithmetic (Jane Yolen), The Breadwinner (Deborah Ellis), Heart of a chief (Joseph Bruchac), and Esperanza Rising (Pam Munoz Ryan) as well as Elijah. We've blogged and talked and each book is their "absolute favorite", hopefullly they will continue reading for pleasure through middle school. See the book trailer here!! J and I read a great picture book last night, Mrs. Muddle's holidays by Laura F. Nielsen, a very fun read, demonstating how some folks just have joy of life!!! Mrs. Muddle m oves to Katie's neighborhood and shows all the neighborhood children a host of new holidays. She just has a spectacular outlook on life and I might have to "borrow" the "leaf fairy" idea to motivate my little helpers! 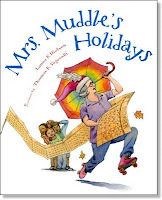 Check out Mrs. Muddle's Holidays to brighten your day!! Another great review here.